superdumb supervillain: Where in the World? their comment: I think Russia or China would be very interesting. I grew up in Hawaii and my knowledge of geography has always been somewhat suspect. (When I was in college, for example, I hitched a ride from the CMJ conference in NYC to Philadelphia, because I thought it would get me closer to Boston. Umm, no.) Anyway, the point is, I hope my kids have a better grasp on where things are in the world than I did. As much as I loved poring through old library books about kids from different cultures, I never had much of a concept of them being like me. Luigi is from Italy and loves to eat spaghetti when he brings the goats in from the fields! 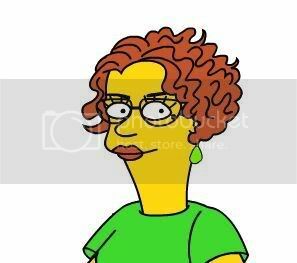 just wasn't very cool, probably not in little part that the books were ancient and outdated. From the '60s or even the '50s, when all the kids were very, very foreign indeed. Nowadays, with globalization and the internet, the world is much smaller but there are still cultural differences and new lands to discover. Compass KidZ aims to capture the love of exploring that all kids share. It's a collectible game, online pen pal message board, and learning tool, all wrapped up in one. 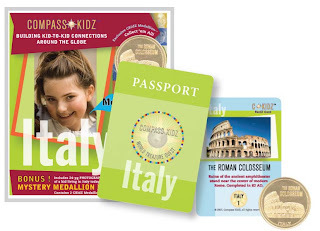 Tweens can travel the world virtually and "make kid-to-kid connections around the globe" by collecting the CkidZ medallion sets. 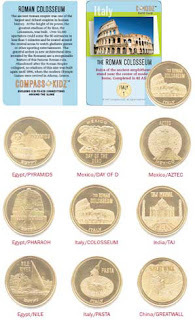 Each CKidZ Medallion Set comes with two medallions representing different world treasures, one chosen by the kid Ambassador pictured on the front of the set, and one "mystery medallion." 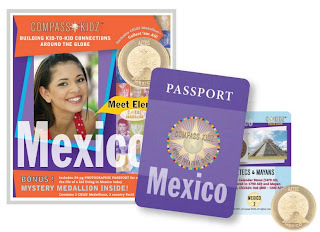 Also included are a CKidZ Passport featuring 24 pages of information about the Ambassador's country and their own, more personal stories about life in their country today, and 2 FactZ cards that have unique codes to unlock content on the CKidZ PenPalZ site, with parental permission. The website also features Global ForumZ and other fun activities aimed at learning more about different cultures, including blogs and TreaZure Chest for medallion codes and SouvenirZ points. 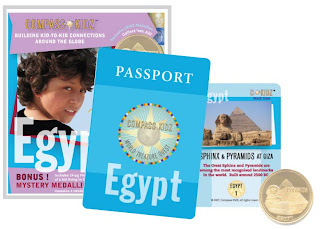 To enter and win a medallion starter set of your choice (Egypt, Italy or Mexico), check out the Compass KidZ offerings currently available and comment on this post with a country you'd like to see represented in the future! Entries will be accepted through February 3rd. US/CA readers only, please. Make sure you leave an email address or that you have one accessible on your blog so you can be contacted if you win! If I can't find your email, I will have to pick a new winner. PLEASE MAKE SURE YOUR BLOG PROFILE IS SET TO PUBLIC AND THAT THERE IS AN EMAIL AVAILABLE ON YOUR BLOG OR LEAVE AN EMAIL ADDRESS ALONG WITH YOUR COMMENT!!! Only one entry/comment per person, please. Order your favorite Compass KidZ Medallion sets at Learning Tree Games and use the coupon code SUPER-CKFREE at checkout to get a free Medallion! I think Russia would be a nice to know about. I'd love to see Hungary! That's my background, but I've never been. I'm not entering since my kids are too young to enjoy this but I just wanted to say that this looks like a neat product. Deutschland for sure - I miss Germany! I'd love to see Germany- we're taking a trip there soon! I'd like to see Japan because they have alot in common with us and alot that is different. I'd love to see Turkey on there! I would really love to see a set about Russia. What a fun idea! I would love to see one for every country, but let's start with China or maybe Japan...or Russia! I hated geography in school and was under the impression only the 'dumb' kids took geography. But I don't believe that anymore. I am embarrassed by how many people in our country don't know the geography in America, much less other countries! 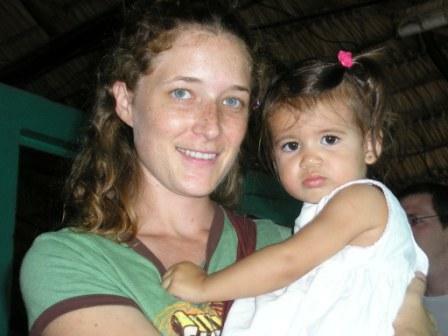 i would love Ecuador...I spent a year teaching there...a beautiful country! that's really a super neat idea.. I agree.. defently Turkey! I spent years in Germany and had 3 kids there, so that would be nice, or France, where my kids went for missionary work and hope to return to. But Norway would also be nice, we haven't been there but we have family there. Thanks for stopping by my boon Giveaway! Being from Australia, that would be one suggestion. Or I think China would be fascinating! I think Nepal, India, Tibet, and maybe Tahiti would be nice additions! Spain is my favorite country to visit, so that would be my vote. What a great idea! I would love to see the Netherlands -- that's where I was born! I would love to see Austria offered! I visited there over 10 years ago, and would love for my kids to learn about it as well! Thanks for sharing! korea- where our son was born! Maybe not very exotic to most, but I'd love to have a Puerto Rico kit for my kids. They are half Puerto Rican, but I don't know when or if we will ever be able to afford to go, so it would be nice to have this to learn about where their Daddy grew up! Ireland - Where I've always wanted to go. Germany, I think would be a wonderful place to get to know better! I would love there to be one on China to help educate my girls on where their youngest sister came from! What a neat product! I would love to see one from all the major countries but I'll vote SCOTLAND for this contest!